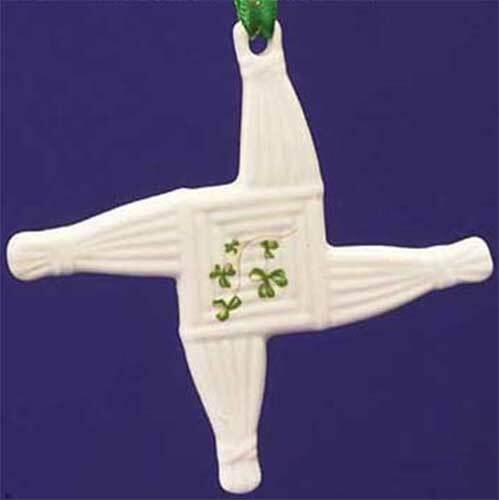 St. Brigid's cross Christmas ornament is crafted of fine bone china and features the trellis shamrock motif. The most enduring image of St. Brigid is the cross she wove from straw-like rushes. This St. Brigid's cross Christmas ornament measures 3 1/2" wide x 3 1/2" tall with a dimensional design that is enhanced with green shamrocks. The double sided design is made of fine bone china and it is ready to hang with the included green ribbon. The St. Brigid's cross ornament is made in Ireland by Royal Tara China and it is gift boxed with shamrock and St. Brigid's history cards, complements of The Irish Gift House. St. Brigid's cross ornament is crafted in Ireland using 7 different types of wood.